Posterior component separation with transversus abdominis release and implantation of synthetic mesh in the retromuscular space is a durable type of repair for many large incisional hernias with recurrence rates consistently less than 10%. The purported advantage of biologic prostheses in contaminated fields has recently been challenged, and the concern for placing synthetic mesh in contaminated fields may be overstated. There are almost no data specifically addressing the use of this type of repair for chronic incisional hernias in trauma and emergency general surgery patients, so research is needed on this patient population. 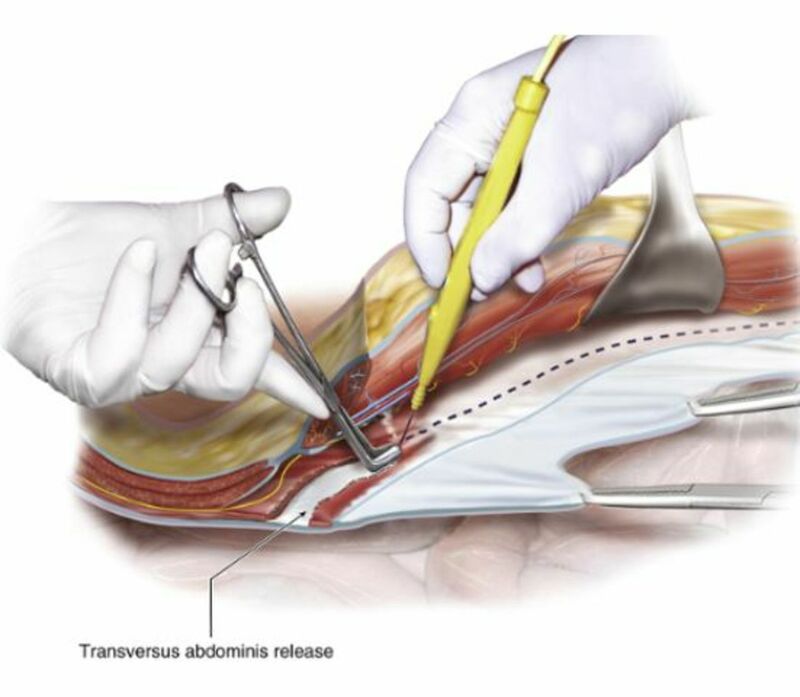 In this review, a case of a trauma patient receiving posterior component separation with transversus abdominis release and implantation of synthetic mesh for a chronic incisional hernia resulting from a gunshot wound to the abdomen is presented, the technique is explained, and relevant literature is reviewed. A 52-year-old man sustained a gunshot wound to the left upper quadrant of the abdomen. He had peritonitis and was taken for emergent exploratory laparotomy. He was found to have injuries to the small bowel, transverse colon, and the right colon. He underwent small bowel resection and extended right colectomy without anastomoses, and he was packed open with a temporary abdominal closure. He was taken back to the operating room 2 days later, the packs were removed, and two anastomoses were performed. His abdominal wall was closed at this time. On postoperative day 10, the patient eviscerated. Closure of the fascia was not possible, and he underwent split-thickness skin grafting to his abdominal wall on postoperative day 14. The soft tissue defect measured 24 cm × 10 cm at that time. His hospital course was further complicated by a low-output enterocutaneous fistula, and this never closed. 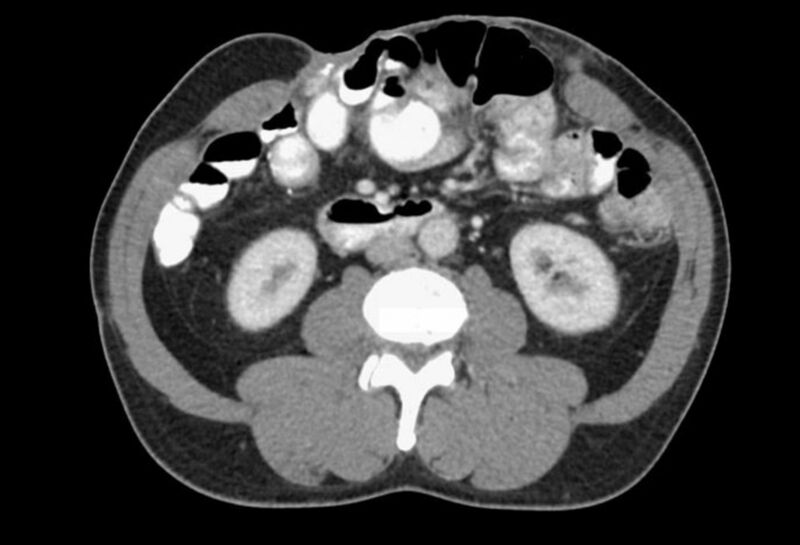 The patient was then lost to follow-up until he was admitted with acute cholecystitis 9 months later. At that time, the fistula was still present, but the output was only a few cubic centimeters per day, and contamination was minimal. Ultrasound showed gallstones with mild gall bladder wall thickening and pericholecystic fluid, consistent with acute cholecystitis. Along with demonstrating the enterocutaneous fistula, CT scan showed a wide abdominal wall defect, with the rectus muscles separated by about 12 cm (figure 1). The patient was thus scheduled for cholecystectomy, reversal of the enterocutaneous fistula, and reconstruction of the abdominal wall. Preoperative CT showing large abdominal wall hernia. At operation, the skin graft was first removed from the underlying viscera. This was not difficult. Extensive adhesiolysis was then performed. Cholecystectomy followed this, and the gall bladder was found to be chronically inflamed. Next, resection of the ileocolonic anastomosis was performed, as the fistula was found to originate from the old ileocolonic staple line. A stapled ileocolonic reanastomosis was fashioned. 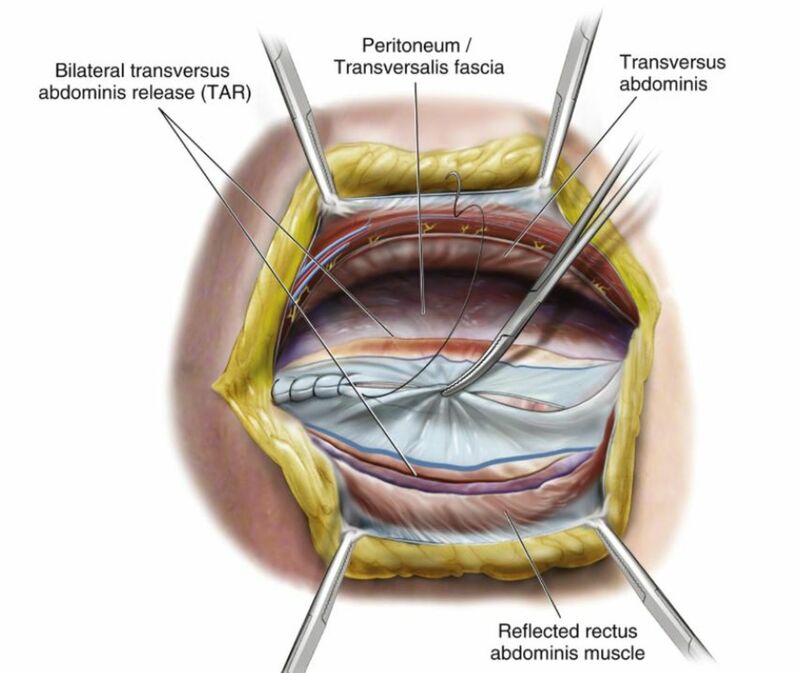 A retrorectus dissection along with release of the transversus abdominis muscle was performed. A 28 cm × 15 cm piece of polypropylene mesh was cut to shape and placed as a sublay into the retrorectus/preperitoneal space. The patient had no in-hospital complications and was discharged on postoperative day 8. He was later readmitted on postoperative day 20 with an early postoperative small bowel obstruction along with a 3 cm × 18 cm × 18 cm seroma in the retrorectus space. Both resolved spontaneously. A CT scan which was performed at that time showed that the hernia had been repaired and demonstrated apposition of the rectus muscles in the midline (figure 2). He was last seen 2 months postoperatively and was feeling well, tolerating a diet, had no pain and no evidence of infection, and was able to do a sit-up in the office without evidence of recurrent hernia. 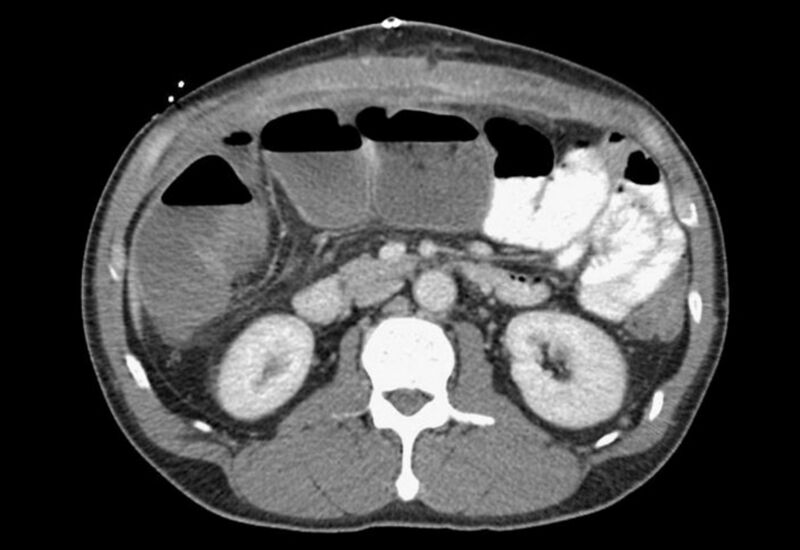 Postoperative CT scan with excellent approximation of abdominal wall. 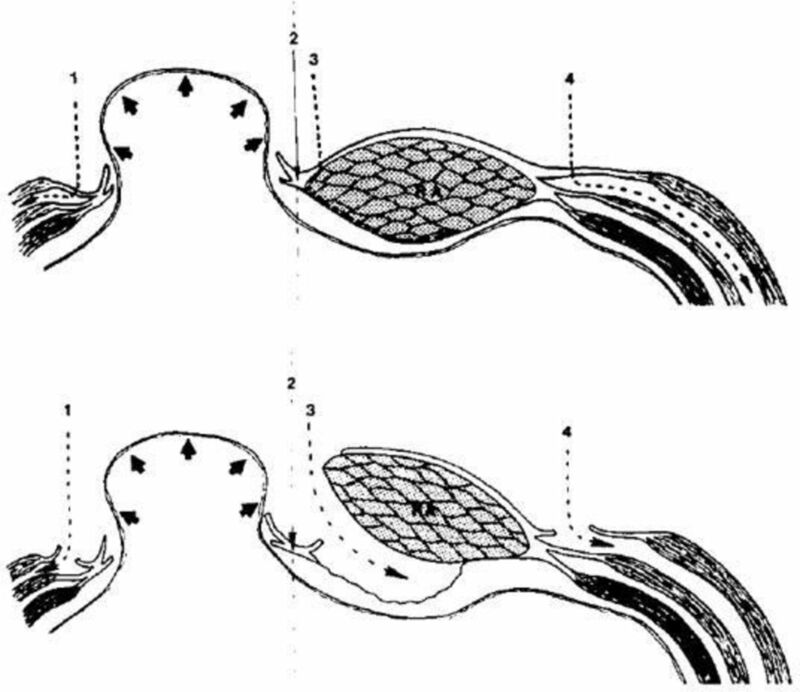 Anterior component separation as described by Ramirez et al (Reprinted with permission from Ramirez OM et al 1). The PCS/TAR technique is thus an extension of the retromuscular RSW repair. It has three main advantages.3 First, it results in significant medialization of the posterior rectus sheath. Second, it allows for extensive lateral dissection in the large potential space between the transversus abdominis muscle and the underlying transversalis fascia and peritoneum. Finally, PCS/TAR avoids disruption of the nerves and blood supply to the rectus abdominis muscle and the anterolateral abdominal wall skin. These nerves and blood supply run in the plane between the internal oblique and the transversus abdominis muscles. PCS/TAR allows a tension-free repair with a large mesh, and it results in myofascial coverage both anterior and posterior to the mesh, potentially restoring the native biomechanics of the abdominal wall. A comprehensive understanding of the anatomy of the anterior abdominal wall is critical when performing PCS/TAR.8 In the upper two-thirds of the abdominal wall, above the arcuate line, the anterior rectus sheath is derived from the external oblique aponeurosis and the anterior component of the internal oblique aponeurosis. The posterior rectus sheath is derived from the posterior component of the internal oblique aponeurosis and the aponeurosis of the transversus abdominis muscle. The rectus abdominis muscle sits between the anterior and posterior rectus sheaths superior to the arcuate line. 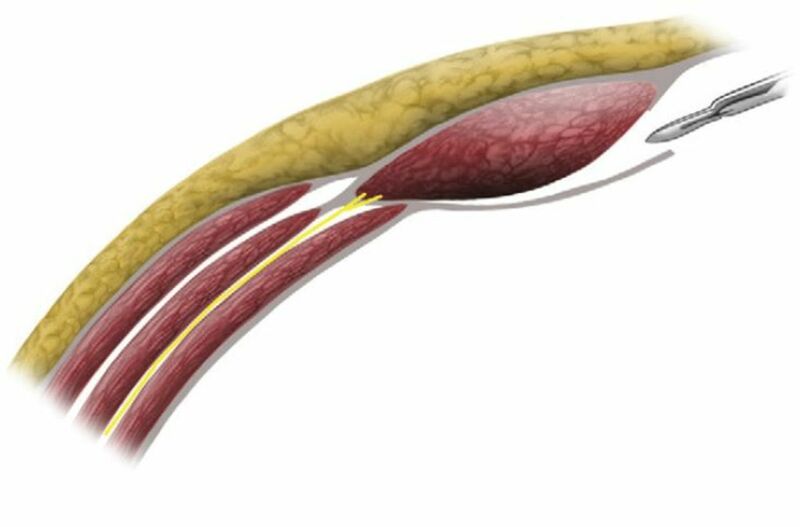 Below the arcuate line, the anterior rectus sheath is derived from the aponeuroses of all three muscles: the external oblique, the internal oblique, and the transversus abdominis muscles. The posterior rectus sheath does not exist below the arcuate line. The rectus muscle is only separated from the abdominal viscera by the transversalis fascia and the peritoneum. The achievement of a wide lateral mesh overlap of the hernia defect is critical to the PCS. Stoppa and Fischer termed this concept, ‘Giant prosthesis for reinforcement of the visceral sac.’9 The most common polymer used in surgical meshes is polypropylene.8 The mesh then induces a strong inflammatory reaction upon implantation. This is generally desired but can lead to excessive fibrosis, loss of pliability, and chronic pain. When exposed to bowel, it may also lead to extensive adhesions and/or fistulas. Traditional ‘heavyweight’ meshes demonstrate four times the tensile and burst strength of the native abdominal wall.10 These may be overengineered for use in most hernia repairs. The latest generation of meshes, therefore, has been designed to reduce the amount of implanted prosthetic material. These ‘lightweight meshes’ are made with thinner filaments and/or a larger pore size, resulting in a marked reduction in the ‘weight’ of the mesh, often greater than 50%. Such a weight reduction potentially allows for decreased inflammatory reaction, more flexibility, and improved compliance, especially long term. Meshes with larger pore sizes have markedly improved tissue reaction, decreased fibrosis, and likely a lower infectability. In general, a mid-weight, macroporous polypropylene mesh is used when performing PCS/TAR. The PCS/TAR operation begins by making a skin incision over the hernia defect.3 8 The subcutaneous tissue is divided and the fascia and the hernia sac are identified. The peritoneal cavity may or may not be entered. The first key step in PCS/TAR is entry into the retrorectus space. 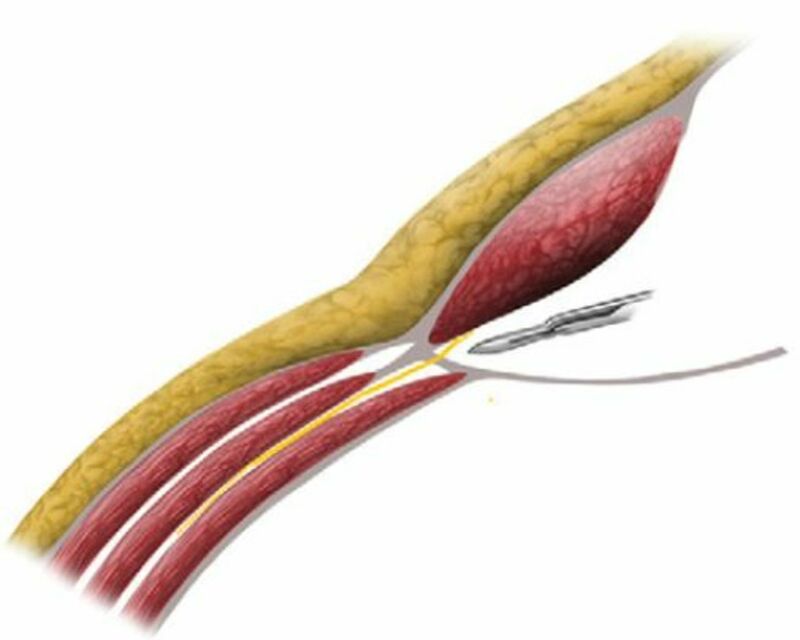 This is done by making an incision into the most medial aspect of the posterior rectus sheath as close as possible to the linea alba (figure 4). This dissection is then performed laterally to the linea semilunaris, the most lateral aspect of the retrorectus space, using a combination of both blunt and sharp dissection (figure 5). Posterior component separation/transversus abdominis release (PCS/TAR) begins by entering the space between the rectus abdominis muscle and the posterior rectus sheath (Reprinted with permission from Novitsky YW, Elliott HL, Orenstein SB, Rosen MJ. Transversus abdominis release: a novel approach to posterior component separation during complex abdominal wall reconstruction. Am J Surg 2012;204:709–16). The posterior rectus sheath is divided, taking care to avoid the perforating nerves (Reprinted with permission from Novitsky YW, Elliott HL, Orenstein SB, Rosen MJ. Transversus abdominis release: a novel approach to posterior component separation during complex abdominal wall reconstruction. Am J Surg 2012;204:709–16). Next the posterior rectus sheath is divided as laterally as possible, taking care to avoid the subcostal nerves. This allows visualization of the underlying transversus abdominis muscle, and the fibers of this muscle are divided with electrocautery (figure 6). The retromuscular space is then bluntly developed to as far as the lateral border of the psoas muscle. The dissection is repeated on the opposite site and may be carried superiorly to the central tendon of the diaphragm, using a subxiphoid and retrosternal dissection. It may also be developed inferiorly to the retropubic space. Next, the posterior rectus sheaths are approximated to one another (figure 7). The transversus abdominis muscle is divided (Reprinted with permission from Novitsky YW8). The posterior rectus sheath is reapproximated (Reprinted with permission from Novitsky YW8). A sublay mesh is then placed into the retromuscular space that has been developed. The mesh thus lies in the retrorectus space between the rectus abdominis muscle and the reapproximated posterior rectus sheaths medially and in the space between the transversus abdominis muscle and the peritoneum laterally (figure 8). The peritoneum is very thin in this location and tears may occur here that are very difficult to repair. These fenestrations, if they occur, should be repaired. Often a small piece of absorbable mesh will need to be used for this purpose. 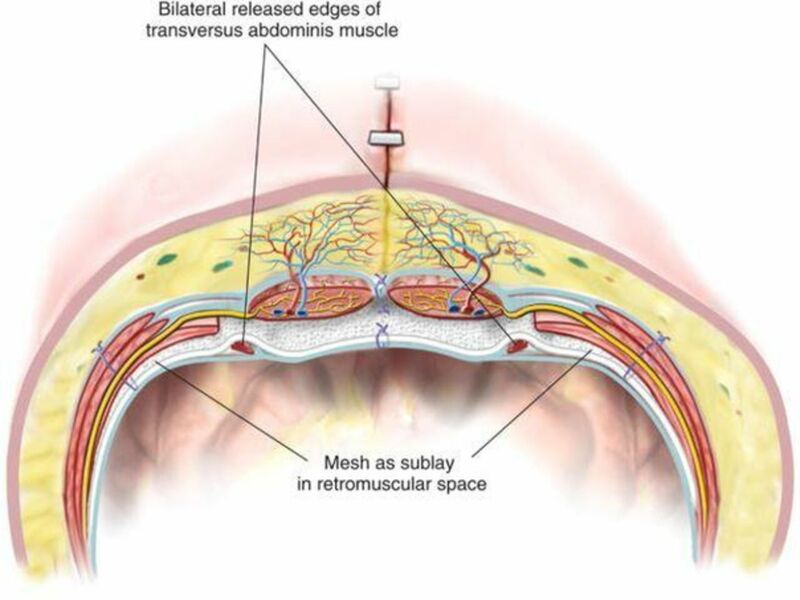 Although transfascial sutures are used by some surgeons, others think the mesh does not need to be sewn into place, as it is secure because it wraps around the visceral sac. After the mesh has been placed, the anterior rectus sheaths are sewn together over the mesh, and this is followed by closure of the subcutaneous tissue and skin. Sublay mesh placement in the retromuscular space (Reprinted with permission from Novitsky YW. Open retromuscular ventral hernia repair. In: Rosen MJ, ed. Atlas of a bdominal w all r econstruction. Philadelphia, PA: Elsevier, 2012). There have been many recent studies evaluating PCS/TAR, but only a few involving specifically emergency general surgery patients and essentially none in trauma patients. In 2013, Carbonell et al reviewed 100 patients with contaminated (58%) and clean-contaminated retrorectus mesh hernia repairs with or without TAR and reported a 7.1% incidence of surgical site infection for clean contaminated cases and 19.0% for contaminated cases, with only seven recurrences, of which four required mesh removal.12 The authors noted that one piece of biologic graft had the same cost as 100 pieces of synthetic mesh. The authors concluded that the surgical dictum that a synthetic mesh is contraindicated in a contaminated field during open abdominal wall reconstructions is not valid. Krpata et al compared 111 patients who underwent either anterior component separation or PCS.2 Of note, a biologic prosthesis was used in 83.9% of those receiving an anterior component separation and in only 25% of those who received a PCS. There was no difference in the rate of fascial closure between the groups (~91%). The anterior group, however, had more recurrences (14.3% vs. 3.6%) and more wound complications (48.2% vs. 25.4%). It was postulated that the lower wound morbidity was related to the preservation of the abdominal wall blood supply by eliminating the skin and subcutaneous tissue flaps needed for the anterior approach. In 2014, Lee and colleagues published a systematic review of 32 studies and found that pooled infection rates were 31.6% with biologics and 6.4% with synthetic non-absorbable prosthetics in clean-contaminated cases, with similar hernia rates.13 In contaminated and/or dirty fields, wound infection rates were similar (~40%), but pooled hernia rates were 27.2% with biologics and 3.2% with synthetics. The authors concluded that the available evidence, while limited, does not show the superiority of biologic over synthetic absorbable prosthetics in contaminated fields. Majumder et al published a multicenter retrospective review in 2016 in which 126 patients underwent major ventral hernia repair in clean-contaminated or contaminated fields.14 Sixty-nine had implantation of a biologic prosthesis and 57 had a synthetic mesh placed. Of the 126 patients, 112 (89%) underwent PCS/TAR. Surgical site infections occurred in 12.3% of the synthetic group and in 31.9% of the biologic group, whereas recurrences occurred in 8.9% of the synthetic group and in 26.3% of the biologic group. The authors concluded that their findings supported the suitability of synthetic mesh and challenged the purported advantage of biologics in contaminated settings. Also, in 2016, Novitsky et al reviewed a database which included patients from December 2006 to December 2014, in which 428 consecutive patients undergoing PCS/TAR with synthetic mesh were analyzed.15 The mean age was 58, the mean body mass index was 34.4 kg/m2, and the mean hernia defect area was 609 cm2. Of these patients, only 39 (9.1%) developed a surgical site infection, only three patients required mesh debridement, and none required a mesh explant. In addition, of 347 (81%) of those with 1-year follow-up, only 13 (3.7%) had recurrences. In 2015, Petro et al published an article looking at the use of PCS/TAR in 34 patients with a history of an open abdomen.16 Of these, the fascia was closed in 11, a skin-only closure was done in 4, a split-thickness skin graft was performed in 16, and the wound closed by secondary intention in 3. Of these cases, 21 (61.8%) were contaminated, 7 involved takedown of enterocutaneous fistulas, 4 involved stoma revisions or reversals, and 3 involved excisions of infected mesh. These patients developed 12 surgical site occurrences, 1 dehiscence, 2 hematomas, 1 seroma, and 8 (23.5%) surgical site infections. No patient developed an enterocutaneous fistula or a chronic mesh infection. With a mean follow-up of 18 months, two new parastomal hernias and three midline recurrences have been documented. The authors concluded that the use of PCS/TAR in patients with a history of an open abdomen is associated with low significant perioperative morbidity and recurrence. In another study, Pauli and colleagues showed that PCS/TAR can address recurrent ventral hernias which developed after initial treatment with anterior component separation.17 The authors noted that anterior component separation treatment of ventral hernias with external oblique release has a recurrence rate of up to 32%. This group reported 29 patients who developed recurrent hernias after anterior component separation, all of which were repaired with PCS/TAR and retromuscular mesh placement and fascial closure. The authors reported 13 (45%) surgical site recurrences, 8 (28%) surgical site infections, and only 1 recurrence, in a patient who developed an organ space infection with frank spillage of stool, requiring mesh excision. To evaluate the function of the abdominal wall after PCS/TAR with mesh sublay, Criss et al studied 13 patients who agreed to dynamometric analysis both before and 6 months after operation and showed that PCS/TAR was associated with improvement of peak torque, power during isokinetic analysis, and quality of life.18 The authors concluded that restoration of the linea alba by returning the rectus muscles to the midline is associated with improved function of the abdominal wall. Recently, there has been an emergence of literature about minimally invasive approaches to PCS/TAR.19–22 PCS/TAR has traditionally been performed as an open procedure, but robotic TAR is a novel, minimally invasive technique that combines the benefits of the RSW approach with bilateral TAR with the well-established benefits of minimally invasive surgery. In robotic TAR, pneumoperitoneum is first established with optical access. Then three robotic trocars are inserted laterally under direct visualization. Lysis of adhesions is then performed. The next steps mimic open TAR: the retrorectus plane is developed, the transversus abdominis muscle is divided, and retromuscular dissection is performed. The process is then repeated on the contralateral side. Then the medialized posterior sheaths are reapproximated, and the anterior sheath is closed. The retromuscular pocket that remains is then measured in cranial-caudal and transverse dimensions, and a mesh of appropriate size is placed laparoscopically. Bittner and colleagues performed a retrospective review of patients who underwent open TAR or robotic TAR from January 2015 to August 2016.20 Of 102 patients, 76 underwent open TAR and 26 had robotic TAR. The robotic TAR group was noted to have a longer operative time (365±78 vs. 287±121 minutes; p<0.01), but the authors note these were the first robotic TARs they had done. The robotic TAR group, however, had a trend toward lower morbidity (19.2% vs. 39.4%; p=0.09), less severe complications, similar low rates of surgical site infections (3.8% vs. 2.6%; p=1.0) and readmissions (7.7% vs. 6.6%; p=1.0), and a shorter median length of hospitalization (3 days (95% CI 3.2 to 4.3) vs. 6 days (95% CI 5.9 to 8.3)). PCS/TAR with sublay implantation of polypropylene mesh, as demonstrated above, appears to be a durable repair for complex hernias, having a low rate of recurrent herniation and a low rate of surgical site occurrences and infections compared with repairs using a biologic prosthesis. These findings are consistent across multiple studies, as noted above. The concern about infected mesh may be overstated as multiple reports have shown a very low incidence of infected mesh and an even smaller likelihood of the need for mesh explantation. Therefore, even infected mesh may be treated by local debridement of mesh rather than total explant. Of note, PCS/TAR is a difficult repair to perform and there will be a significant learning curve associated with it. This operation may be particularly difficult in patients who have had prior abdominal wall hernia repairs, particularly if mesh had been used. Only sparse literature specifically addresses the use of PCS/TAR in trauma and emergency general surgical patients, so indications for this procedure in these patients will have to be extrapolated from data on unspecified general surgical patients. PCS/TAR with synthetic mesh is a durable repair for many incisional hernias with recurrence rates consistently below 10%. The purported advantage of biologic prostheses in contaminated fields has recently been challenged, and the concern for placing mesh in contaminated fields may be overstated. The PCS/TAR approach continues to evolve, including minimally invasive/robotic approaches. There are almost no data on the use of PCS/TAR in trauma patients, and further research is needed on this patient population. Given the numerous benefits of this technique, PCS/TAR should be an addition to the armamentarium of surgeons who perform complex hernia repairs.
. "Components separation" method for closure of abdominal-wall defects: an anatomic and clinical study. Plast Reconstr Surg 1990;86:519–26.
. [Treatment of large eventrations (apropos of 133 cases)]. Minerva Chir 1977;32:749–56.
. [Original procedure of groin hernia repair: interposition without fixation of Dacron tulle prosthesis by subperitoneal median approach]. Chirurgie 1973;99:119–23.
. Giant prosthetic reinforcement of the visceral sac. Surg Gynecol Obstet 1989;169:408–17.
. Open retromuscular Ventral Hernia Repair. Rosen MJ , Atlas of abdominal wall reconstruction. Philadelphia, PA: Elsevier, 2012.
. Fischer JE , Giant prosthesis for reinforcement of the visceral sac in the repair of groin and incisional hernias. 5th edn. Philadelphia, PA: Lippincott, Williams & Wilkins, 2007.
. Synthetic Mesh Choices for Surgical Repair. Rosen MJ , Atlas of abdominal wall reconstruction. Philadelphia, PA: Elsevier, 2012. Contributors JJC designed and wrote the article. OLG, JJD, VPH, and PRM were involved in critical revisions and editing. Data sharing statement No original data are to be published in this article.